We had an egg hopper-breakfast planned at Pearl Beach but even though Kamal is an excellent chef, he is not equally good with schedules. We risked getting late and had to have a breakfast at the bus station instead. It turned out to be the best Rotti we had since we arrived and, at the same time, one of the cheapest as well. That is usually how it is here, the cheapest food is quite often the best! Me and J have quite different opinions about travelling by bus in Sri Lanka. Up until now it had not been too bad but after this day’s bus rides to Ella I am hardly a spokesman for bus rides in Sri Lanka. It was incredibly hot, crowded and in addition there were Sri Lankan music pumping loud with a bass that made it impossible to sleep. It felt like an interesting cultural experience for about 15 minutes but then it was just painful. The heat was really the worst, especially when the bus was just waiting at a bus station where there were no wind to cool things off. No, this was not my cup of tea! The last part up to Ella was, however, much nicer. 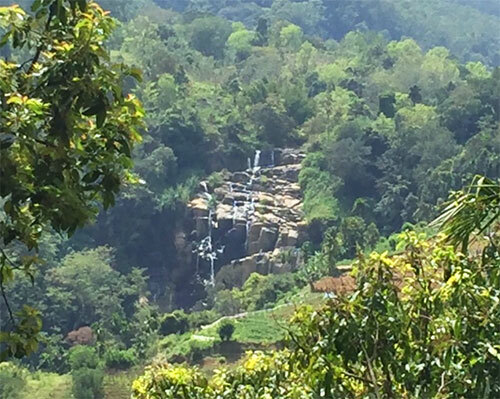 We went up the serpentine roads and the view was just getting better and better and we passed water falls and astonishing views. Ella is more expensive than the coast but we (J, of course) managed to find a really nice room (the best we have had so far) at a guest house called Bloom Rose (which I can highly recommend) for 1.500 Rp. At dawn we made a hike up a hill called “Little Adam’s Peak” which does not have much resemblance with the popular tourist magnet Adam’s Peak a few hours away. 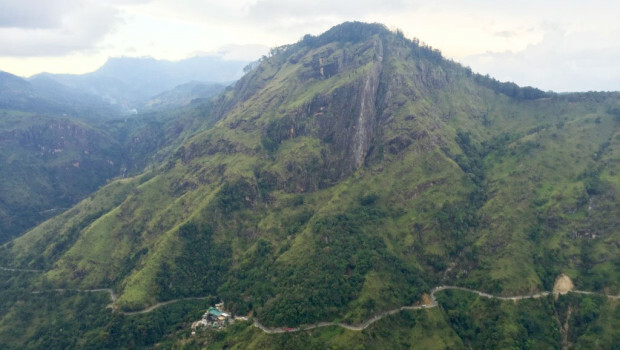 Little Adam’s Peak is, however, a very nice one hour hike that is not particularly difficult (even kids can do it). 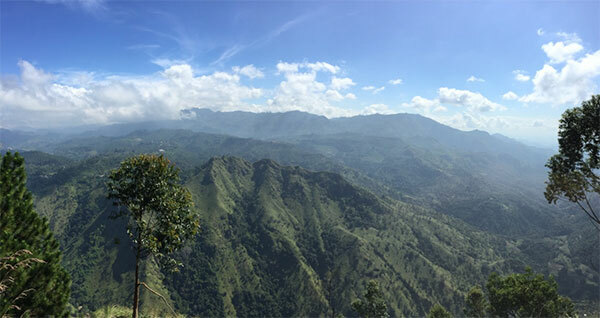 When you reach the top you are rewarded with an amazing view over the valley and Ella Rock. It is well worth the climb! The next day we raised the bar a notch and climbed Ella Peak, the beautiful and relatively high peak you can see from Ella. We had read about it and several websites mentioned that you may need a guide to do the climb. 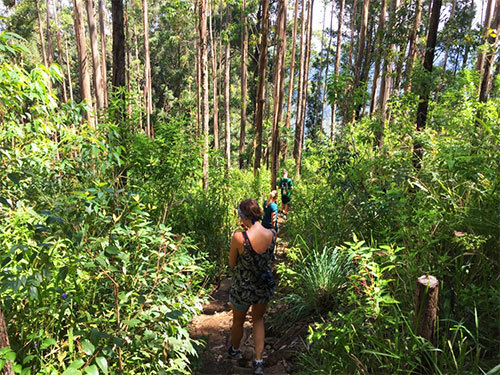 The need for a guide is not so much because it is a complicated climb but instead because it is rather tricky to find your way through the paths to the base of the peak. We found some good instructions in a blog that helped us out a lot. The guide was not complete so we managed to walk up a few bad paths but it seemed to be far less than what many others had done, it seems. 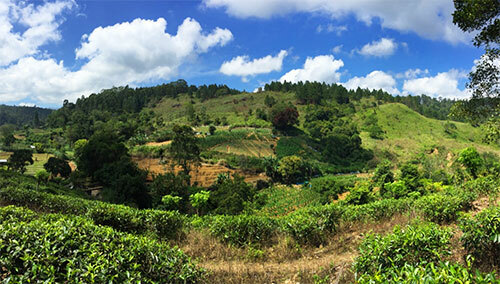 Tea plantations surrounds the first part of the hike up Ella Peak. There are plenty of locals to ask when you hike up Ella Peak. Waterfall in the far distance. 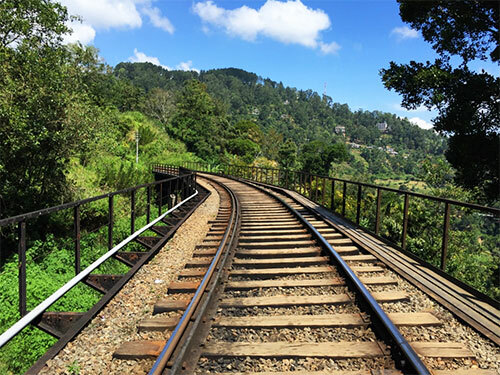 The first part of the walk to Ella Peak is on the railroad tracks which is an amazing walk through tea plantations and areas with amazing views. You want to stop and take photos every hundred meters you walk. Although there are no high speed trains on the tracks you should probably keep an eye on the train time tables so you do not get surprised – especially on the bridge (unless you want to re-enact the movie Stand by me). The bridge where you do not want to get caught when the train pass by. 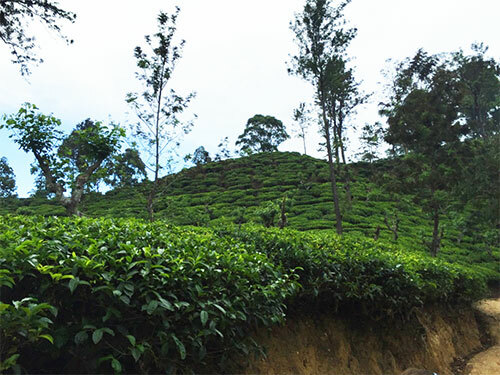 The hike up the mountain is through the same tea plantations as you pass by and this part is quite easy. The second part of the hike through the forest is much heavier though since the inclination is much more steep. My stamina is not excellent at the moment and I have to stop several times to pause and catch my breath. This second steeper part is fortunately not very long and it only takes us some 20-30 minutes (including breaks) to hike this part. The hike (down) in the forest. In blogs we read the view from Ella Peak had been compared to the peaks in Nepal etc so our expectations were high. Even though the view was great it was not THAT spectacular to be honest. It is magnificent to look out over the valley but I do not find it as dramatic as I hoped. I enjoy the view for a few minutes, take a few photos but I do not really know what to photograph. 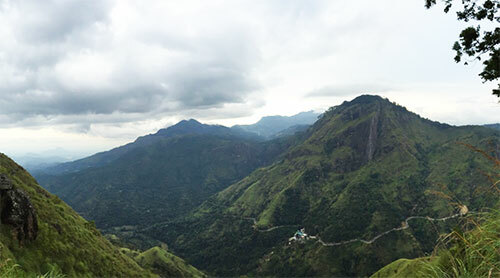 The view from “Little Adam’s Peak” is, in my opinion, more beautiful since you actually look at Ella Peak which, in itself, is a very beautiful peak. The view from Ella Peak is great but not really as dramatic and exciting as I had hoped for. Since our room was fully booked the second night and we had no more hikes planned we decide to get on the train to Nuwara Eliya after our hike. It would have been nice to stay in Ella a bit longer but we had heard Nuwara Eliya was supposed to be equally nice. 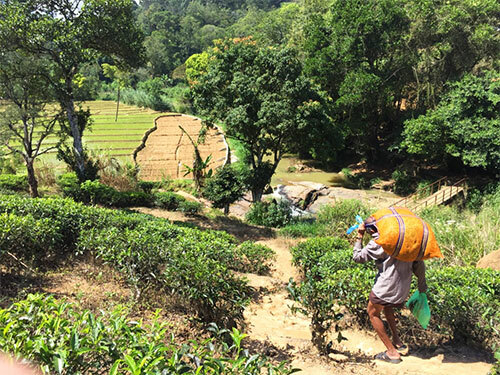 My recommendation: Ella is a beautiful little village that you definitely should include in your route around Sri Lanka. Here you will find hikes of different difficulties and a good supplyof restaurants, many with excellent views. We stayed a bit too short (knowing what I know now) so if you like mountains and hiking plan for at least two nights here. 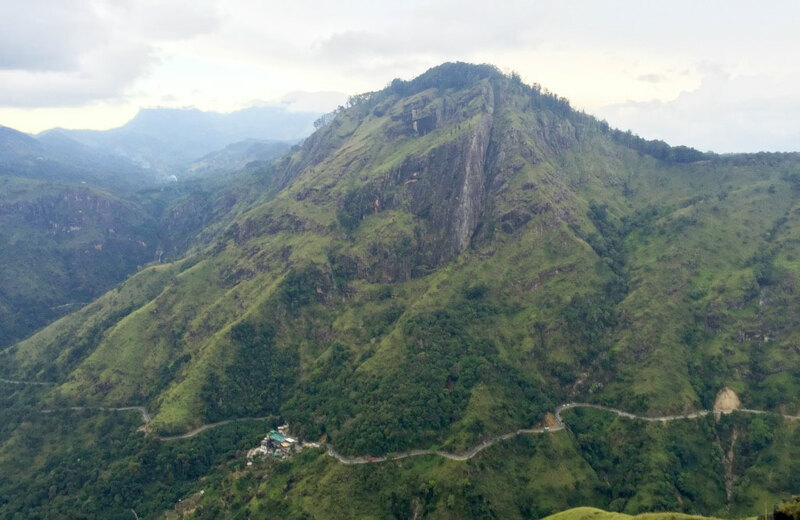 Both Little Adam’s Peak and Ella Peak are worth the effort. Make sure you read up on how to get up on Ella Peak before you go though.